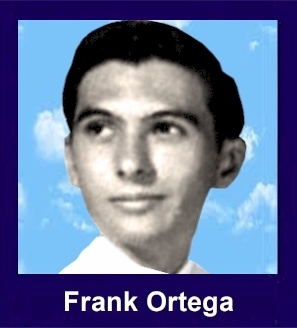 The 35th Infantry Regiment Association salutes our fallen brother, PFC Frank Dennis Ortega, who died in the service of his country on February 25th, 1968 in Quang Nam Province, Vietnam. The cause of death was listed as Small Arms Fire. At the time of his death Frank was 21 years of age. He was from Saugus, California. Frank is honored on the Vietnam Veterans Memorial at Panel 41E, Line 26. The decorations earned by PFC Frank Dennis Ortega include: the Combat Infantryman Badge, the Bronze Star, the Purple Heart, the National Defense Service Medal, the Vietnam Service Medal, the Vietnam Campaign Medal and the Vietnam Cross of Gallantry with Palm Unit Citation. Frank is buried in the Calvary Cemetery and Mausoleum/ 4201 Wittier Blvd,/ Los Angeles, CA. For meritorious service in connection with military operations against an armed hostile force in the Republic of Vietnam. Private First Class Ortega distinguished himself while serving as a Rifleman and Team Leader with Company D, 2nd Battalion, 35th Infantry, 4th Infantry Division during the period November 1967 to February 1968. Upon arrival in Vietnam, Private First Class Ortega demonstrated an acute working knowledge of infantry tactics. Despite the hardships and inherent dangers in his units area of operations, he performed his duties in a cheerful and professional manner; gaining him the respect and admiration of both superiors and subordinates. His ability, coupled with his constant striving to improve himself, soon earned him the position of Team Leader. On 25 February 1968, Private First Class Ortega was mortally wounded by a hostile grenade as he directed his men in an engagement with hostile forces a few miles west of Da Nang. His leadership ability and constant striving for improvement were an inspiration to his entire unit and contributed immensely to the units missions. Private First Class Ortegas leadership, initiative, and devotion to duty are in keeping with the highest traditions of the military service and reflect great credit upon himself, his unit, and the United States Army.